Cagliari, Italy (October 13, 2018) - All it took was one last, wild ride on Saturday, the final day of competition at the 2018 Melges 20 World Championship hosted by Yacht Club Cagliari, to give the International Melges 20 Class Association its second-ever, double, back-to-back World Champion - Drew Freides' PACIFIC YANKEE. His magic combination team of tactician Morgan Reeser and crew Charlie Smythe came from third to finish first overall, crowning them supreme for a second year in a row. Filippo Pacinotti's BRONTOLO with Manu Weiller as tactician and crew members Federico Michetti and Silvia Morini were runners up. Igor Rytov's RUSSIAN BOGATYRS with tactician Konstantin Besputin and crew Anton Sergeev rounded out the podium in third. Landing fourth overall and crowned 2018 Corinthian World Champion was Alexander Mikhaylik's ALEX TEAM with crew members Valery Zataravinski and Vitaly Rozhkov. Rounding out the top five was 2018 Melges World League Ranking leader Vladimir Prosikhin at the helm of NIKA with tactician Michele Ivaldi, and crew Giorgio Tortarolo and Lara Poljsak. It was a hard fight on the final day, but what was key for Freides was his ability to stay ahead of Pacinotti and Rytov. With the breeze coming from the East Southeast at 10-12 knots, the final race was filled with a string of emotions as the top three teams were separated by a very slim margin. While Pacinotti and Rytov chose the right side of the course, Freides went left. At the first weathermark things were quite heated as Freides rounded fourth behind Rytov in third, Pacinotti was deep. Just when it seemed that Pacinotti was out the the game, his very experienced team clawed their way back into the top ten finishing the race in sixth, behind Rytov in fifth. With Freides in the winner seat, Mikhaylik had another great race filling in the second place gap, with Krzysztof Krempec's MAG TINY in third. The 2019 World Championship happens April 4-7 in Miami, Florida, hosted by the Coconut Grove Sailing Club. The Melges 20 World Championship is supported by Moby, Tirrenia, Helly Hansen, Garmin Marine, North Sails, Toremar, Harken, Norda, Lavazza, Rigoni di Asiago and Melges Europe. Melges World League has signed and adopts the code of ethics of the Charta Smerarlda strongly promoting the values of One Ocean Foundation. As with other Melges 20 events around the world, racing updates will be posted online at the Official Melges 20 Facebook Page. Be sure to also follow the fleet on Instagram, Twitter and YouTube. Tune in for the latest racing information, results, video interviews and photos at melges20.com. The Melges 20 fulfills the need for a more compact, yet spacious, fast, well-built sportboat. With its introduction, Melges Performance Sailboats delivered the next generation of sailboat racing and competition. An exclusive Reichel/Pugh keelboat design, it is advanced in every respect. Seriously fun, simple to sail, made with high-quality materials and easy to rig, the Melges 20 enjoys a well-established and ever-growing worldwide fleet and fan base. For more information, visit the International Melges 20 Class Association (IM20CA) at melges20.com. 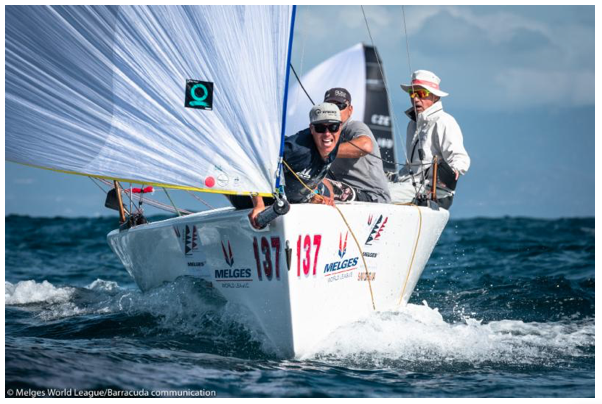 The Melges World League is the ultimate one-design competition, uniting the Melges owners across the globe into one streamlined championship system. It is a season-long series that includes regattas hosted at the world's most desirable venues, featuring sailing's best owner/drivers and Corinthian sailors throughout North America, Europe and Asia. News, results and other info will be published online as it becomes available at melgesworldleague.com.